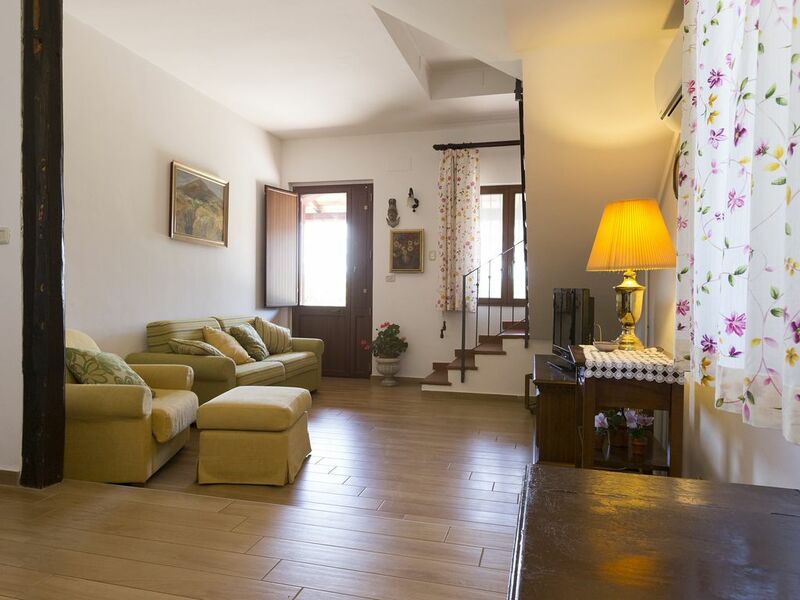 The villa, on two floors, consists of 2 bedrooms, 2 bathrooms with shower on the first floor and a large living room on the ground floor with equipped kitchen, dining area, living area with double sofa bed and adjoining terrace with tables, chairs and BBQ. The villas are located in a residence surrounded by a citrus grove, has a swimming pool and solarium. The villas are equipped with all comforts and also have outdoor space and a convenient parking area. Our employees take care of the cleaning and the change of towels daily, while the sheets (unless otherwise requested) are changed every three days. Our staff is always available for every need, and request information. It is also ready to assist and advise clients in organizing excursions and outings (including taxi and car rental with or without driver). Outside the villas are comfortable terraces with tables, chairs and barbecue grills, n. 2 laundry rooms with washers and dryers, gardens, small playground and ample parking, as well as the mosaic swimming pool surrounded by a large solarium in Sicilian terracotta with adjacent outdoor hot tub. There is also a large gazebo and restaurants, where you can enjoy delicious Sicilian dishes, outdoors or indoors, in front of a relaxing view of our pool. Finally we find ourselves adjacent to a shopping mall useful to stock up on any need. The owners and all employees were so welcoming and sweet. Amazing snacks and coffee every morning, clean house, beautiful pool and grounds. We LOVED it! We are happy for the review of our wonderful guest Amanda, whom surely deserves more compliments than she made us. You and your family will always be welcome in Orange Park. Stayed here for two weeks with my family. It is very rare to find people so willing and helpfull to make your holiday special but you will find them at Orange Park. Stefania, Guiseppe and co are wonderful hosts who really made our stay special. We had the large Fichi D'India villa which had everything we needed, it was cleaned every day with heaps of fresh white fluffy towels to hand. The villa has two air conditioned bedrooms and whilst the systems were old they worked very well. The pool is not heated but believe me in the 36deg heat that was most welcome, there is also a shower at the pool and it was great watching the planes come in whilst sunbathing, they were never obtrusive. Yes you are very close to a huge Mall but for us this was very convenient, the lunches were incredible value very tasty, also great to pick up a rotisserie chicken or pizza at the end of a days travelling. Or some Italian fashions. We spent a week at this beautiful locations, conviently located next to a shopping mall with a grocery store and shops. Close to the airport and also close to the city center and all the fresh mkts. The owner and , Guiseppe and his staff, were very helpful Stephania speaks wonderful english and gave us great recomendations. I would definetly recond Orange Park. The pool and grounds were beautiful. A wonderful family-friendly place to stay! We stumbled upon this gem through the VRBO website and right from my first enquiry Stefania answered every query/question I had very promptly and professionally. She is an invaluable resource of information on any aspect of touring/sightseeing and anything we asked of her while on holidays was dealt with quickly and efficiently. On arrival at Catania airport Stefania had arranged for a taxi to pick us up and bring us to a nearby shopping mall and then directly to Orange park. We arrived at our country retreat and immediately we were shown to our spotlessly villa by Upitise. We availed immediately of the superb pool and then enjoyed a wonderful dinner cooked on site! We hadn't hired a car and Guiseppi very kindly dropped us to Catania one afternoon and took my husband grocery shopping another day. His kindness and also that of his wife is remarkable. He cooked a traditional Sicilian meal for us one day and his wife continually invited my daughters (3&6) to take from her store of toys!! Our villa was very comfortable and had 2 spacious bedrooms and 2 bathrooms. It also had a very large table outside and a little outdoor play area about 20 metres from the back door. There was a laundry room and clothes line also next to our villa. It was cleaned almost daily and linen & towels very frequently changed. Overall we had a wonderful holiday relaxing in total seclusion by the pool and going for a stroll to the nearby shopping centre in the evenings. My daughters loved how quiet the pool was-some days we were the only people there. We arranged a car and driver to take us on the Godfather tour and also to the beach and Etna-all within an hours drive. On hindsight we should have hired a car but the driver made the touring very relaxing! The farm is located near the West ring road of Catania (E45), a major artery that connects the areas of tourist interest in Sicily. Adjacent to the Mall Centro Sicilia, a few kilometers from the international airport of Catania and Catania center. In fact Orange Park is the ideal starting point for day trips to the wonderful city of Siracusa, Taormina, Catania, Acireale, Piazza Armerina, Avola, Noto, Marzamemi, etc. until you come to Agrigento, Enna, Palermo and Trapani. In a few minutes you reach the Playa of Catania and the coast of the Cyclops with its charming villages of Acitrezza, Acicastello, Acireale and, thereafter, the prestigious beaches of Giardini Naxos, Fondachello, Letojanni and Taormina. On the south, the famous beaches of Fontane Bianche, Avola and Noto. Finally you can take numerous excursions to Mount Etna and other parks and nature reserves in Sicily, as well as boat rides on the Ionian coast and trips near rivers Alkantara and Simeto.